The Sinornithosaurus is a species of feathered dinosaur believed to have lived in the Lower Cretaceous Period throughout what is now China. 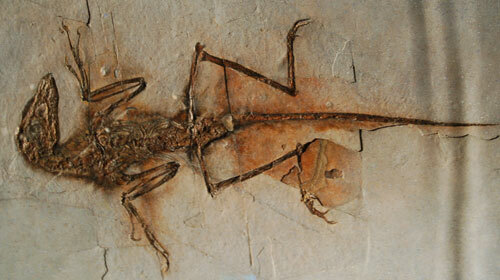 The name Sinornithosaurus comes from a combination of Latin and Greek and literally means ‘Chinese bird-lizard’. The Sinornithosaurus was the fifth feathered dinosaur to be discovered that was not of avian origin and was discovered in 1999. The Sinornithosaurus belongs to the dromaeorsaurid family of dinosaurs and although it has feathers resembling a bird the Sinornithosaurus is believed to be a fairly primitive dromaeosaurus. This is very interesting as common belief prior to the discovery of the Sinornithosaurus is that the dinosaurs of the dromaeosaurid family possibly evolved over time into the bird of today, this discovery however pointed out that in fact the more primitive dromaeosaurs were more like birds than the later examples of the species. The color of the Sinornithosaurus’ feathers is unknown however these feathers are a very important discovery as they represent some of the earliest feathers on an animal in the history of our world and were quite primitive compared to feathered animals today. It is believed that the Sinornithosaurus may have specialized in hunting small prey such as birds due to its long pronounced teeth which would be prefect for getting around feathers and even stripping feathers from its prey. 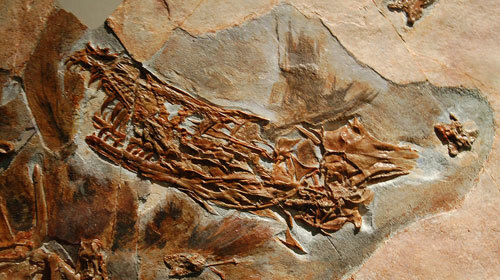 The is evidence in the Sinornithosaurus fossils that the Sinornithosaurus may also have been venomous. In 2009 an extremely well preserved Sinornithosaurus skull was discovered and after examining this skull in great detail it was determined that the Sinornithosaurus was indeed venomous, making the Sinornithosaurus the first venomous dinosaur to be identified. The indications that point to the Sinornithosaurus being venomous include deep grooves along the Sinornithosaurus’ teeth are are associated with venomous animals in the wild today, these grooves act as a channel in which to direct the venom flow. As well as the grooves a small cavity was also identified in the skull of the Sinornithosaurus which likely housed the venom gland and was situated perfectly to distribute venom down the grooves on the Sinornithosaurus’ teeth. the feathers were reddish brown with forms of yellow and black.